CBB research shows that 50 percent of all on-premise drinks were consumed by jovial white women during a stock image photo shoot. Drink sales remain a dynamic and important part of the restaurant and bar business, but finding growth continues to be a challenge for operators and brand marketers alike. Slowed consumer traffic at on-premise locations and stagnancy in occasions involving adult beverages translates to flat total alcohol volume in restaurants and bars in 2017, according to the recently released On-Premise Intelligence Report, jointly developed by Technomic and Beverage Marketing Corporation. Adult beverage category dynamics continue to evolve, with spirits outpacing beer in volume growth. Wine is challenged, experiencing its fourth consecutive year of volume decline on-premise in 2017. Year-end dollar sales are expected to increase 2.1 percent, driven primarily by raised drink prices and continued growth of premium products at the bar. The appeal of differentiated and flavorful adult beverages and the importance of supplier support is evident in the roster of fastest-growing brands on-premise, led by Tito’s Handmade Vodka. But what about craft beer? 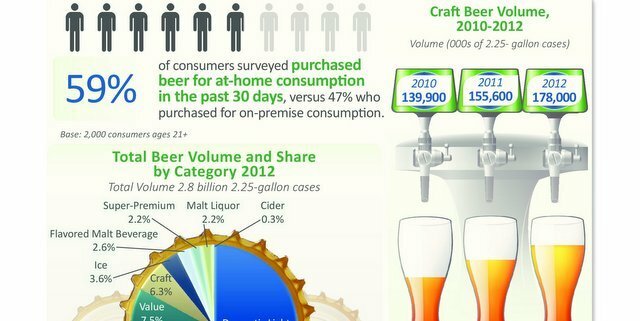 “While craft remains a growth category in on-premise beer, its trajectory has slowed considerably. The category enjoyed double digit growth in restaurants and bars for several years, however, volume expansion slowed to the single digits in 2016 and dropped again in 2017 to 2.6 percent,” she said. But even here, in the broad “overall growth trajectory of craft beer” stat, looking even further still identifies a big growth opportunity for most of the craft breweries out there. “Consumer preferences continue to shift away from mass-produced beer brands, a trend that appears to be impacting the largest craft beer labels as well. Four of the top five craft beer labels shed volume on-premise; the fifth was flat. Samuel Adams Boston Lager, the largest on-premise craft beer brand, experienced the largest volume decline among the leading brands; collectively, the Top 5 brands declined 2.1 percent on-premise, while brands beyond those large-volume labels grew 4.7 percent, indicating that growth is now driven by smaller brands,” she said. We’ve talked about this before. Maybe craft breweries weren’t meant to grow forever and ever until they become their own form of Big Beer. So, a slowing, even reversal, of growth at a certain point of volume might be a market correction of sorts, that has more to do with the ceiling of an individual “craft” beer versus the popularity and opportunity for the category as a whole. That’s our two cents at least. The best on-premise beer performer? Imports. Technomic said imported beer is the most consistent performer in beer on-premise, achieving steady volume increases in recent years and expanding its share of total on-premise beer to 28 percent (+ three points from 2013). Maybe Trump is right. Enough of these foreigners! “The share of consumers reporting monthly+ consumption of craft beer in restaurants and bars has fallen from 48 percent in 2015 to 40 percent in 2017. Younger LDA consumers (21-35) are more engaged with craft beer on-premise than those 35 plus,” the report states. Usually, those very early drinking years are associated with cheap beer you can chug. So, seeing that segment so engaged with quality, local products lends a lot of hope for continued consumer shifts over the long-term. The On-Premise Intelligence Report includes channel, category and brand performance metrics, consumer and operator insights and menu trend information developed via primary research conducted by Technomic and Beverage Marketing Corporation. The report is available for purchase here.